The Braxton Culler Lafayette Sofa 1007-011 has a very nice open and airy styling that lends itself to an island feeling. Natural large and medium size solid rattan poles are used for the frame construction with fine rattan wrapping of the Lafayette furniture collection. Additional accents provided with joint wrappings. Backrest wraps around the back cushion. Nice sculpted hand accents. Extra leg stretchers provides strength and lasting durability. The rattan is available in your choice of finish colors, please see above. The “Comfort Plus” cushions with welted seams offers years of relaxing enjoyment. Many fabric choices available, please see above. The sofa and loveseat each include two 18″ x 18″ throw pillows. 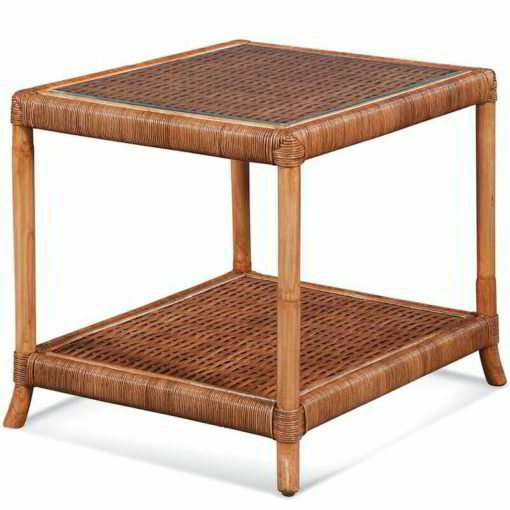 The coffee and end tables each include glass top inserts over a rattan weave. The Braxton Culler Lafayette furniture collection includes a sofa, loveseat, chair, ottoman, coffee and end table, see matching items above right. The Braxton Culler Lafayette Sofa 1007-011 is made in High Point, North Carolina.